Learn more about our community, amenities, floor plans and activities and more. At the senior apartments of Lake Haven near Clear Lake and South Shore Harbor and Oak Haven not far from The Woodlands Mall, you will enjoy coming home to manicured landscaping, a beautiful pool and waterfall, and a one mile walking trail. If you’d like, you can take part in scheduled activities such as water aerobics, church functions, informative guest speakers, board and table games in our community center. Oak Haven and Lake Haven offer the freedom of choice. Here, you will decide what suits your budget, your interest and your fancy. Choose from our one bedroom, two bedroom or three bedroom apartment homes and select from our many luxuries. An array of conveniences and personal services is available just for the asking. 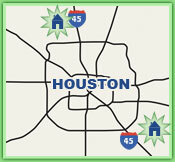 Our new approach to senior living in Houston offers all the comforts and enjoyments of your own home. The fun times and support of a village of friends and neighbors are waiting for you. Please contact us to schedule a personal tour of our neighborly community of people who value each other and their active lifestyle. Walk with us through our small villages of single-story patio-style apartment homes and see why you or your loved will want to move in today. We are currently the only apartment community in the Kemah and Woodlands areas offering this type of lifestyle with so many choices at affordable prices. Availability is limited on some floor plans, so act quickly to avoid being placed on a waiting list. A new way of life is waiting for you at Oak Haven and Lake Haven. Here you will discover the peaceful enjoyment of single story living; no one lives above you or below you, and there are no cumbersome steps to climb. Our communities, which are not assisted living facilities or retirement homes, are the perfect senior communities for active adults living in the Houston area. Oak Haven is located in the quiet neighborhood of Shenandoah, Texas, across from The Woodlands Mall. Lake Haven is located in the quiet South Shore Harbor Neighborhood, near the Kemah Boardwalk, in Kemah, Texas. We invite you to take a tour of Oak Haven and Lake Haven to consider all your options. Our communities are conveniently located near Clear Lake, League City, Galveston, Seabrook, Webster, Dickinson, La Marque, Conroe, Magnolia and Spring, Texas.